Verwendungszweck The ChromoTek Myc-Trap® comprises an antibody fragment coupled to agarose beads for immunoprecipitation of Myc-tagged proteins. Spezifität The Myc-Trap® recognizes the Myc-tag sequence EQKLISEEDL at the N-terminus, C-terminus, or internal site of the fusion protein. 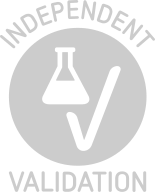 Produktmerkmale Epitope tags are useful for the labelling and detection of proteins using immunoblotting, immunoprecipitation, and immunostaining techniques. Because of their small size, they are unlikely to affect the tagged protein's biochemical properties. The Myc epitope tag is widely used to detect expression of recombinant proteins in bacteria, yeast, insect and mammalian cell systems. For biochemical analysis including mass spectrometry and enzyme activity measurements these Myc-tagged proteins and their interacting factors can be isolated fast and efficiently by immunoprecipitation using the Myc-Trap®. 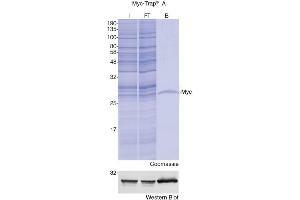 Myc-Trap® utilizes small recombinant antibody fragments covalently coupled to the surface of agarose beads. Produkt verwendet in: LaFlamme, Young, Lang, Weiser: "Alternative splicing of (ppp1r12a/mypt1) in zebrafish produces a novel myosin phosphatase targeting subunit." in: Gene, Vol. 675, pp. 15-26, 2018 (PubMed).